Designer Helen James has been well known on the fashion circuit in Ireland for many years. A native of Dublin, James spent much of the Nineties living in New York, and returned there for a stint in 2010. On both occasions she worked as a designer for Donna Karan and now brings her design nous and love of cooking to her Considered range of homeware, cookware and artisan foods for Dunnes Stores. Helen began designing during her student career at NCAD in Dublin where she studied textile design. Moving to New York in 1993, she worked as a freelance ‘surface designer’ (printed textile designer) for international brand Donna Karan before going on to establish her own label. Helen’s hand-printed silk scarves sold very well – first in New York and then in Ireland to where she returned in 2002. Her designs were stocked in high-end boutiques including Costume in Dublin and Kalu in Naas as well as Harvey Nichols in London and shops in the Middle East. Four years ago Helen got a call from a friend in New York asking her if she would like to do a freelance consultation job, again for Donna Karan but this time in homewares and Helen leapt at the chance, packed up the house and set off for the Big Apple with her husband and three children. After a stint at Avoca, Helen was approached by Dunnes Stores and it was decided that she would create a new brand for the company. Presenting to Margaret Heffernan CEO, Helen found herself proffering a brand which united the food and fashion side of the business. “It was a natural fit with Dunnes because they have both the grocery and textiles side of the business and nothing had been done before to bring the two sides together,” she says. The new range is about functionality and style, clean lines and texture. “If you have a storage jar why should it not be beautiful as well as functional? Being a cook, things have to do their job and earn their place,” declares the designer. Helen believes that her collection is part of a wider mood at Dunnes to offer something a little different and unique to their customers at an affordable price. Designer collections at the retailer include the Willow children’s collection by Leigh Tucker, Carolyn Donnelly Eclectic and Paul Costelloe’s ranges for the retailer. 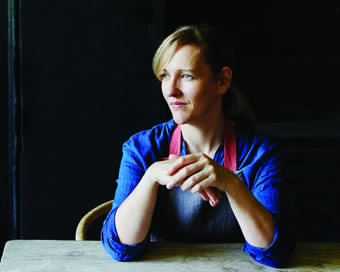 Helen says that she learned her love of food from her grandmothers – “excellent bakers” both – and from her parents who are “excellent cooks”. She says that although she has been baking and cooking since the age of 12 that she hadn’t considered that it could be part of her job until starting a blog in which she began to champion her love of cooking. The design landscape has changed greatly in Ireland since Helen first established her eponymous brand and even more so since Dunnes Stores was established way back in 1944, but so too, says James, has the food. She believes that the design arena is still a difficult one for young people to get involved in and that having a team of experts to work with at Dunnes has allowed her the freedom to concentrate on the brand in a way she never could as a sole trader. She says she also finds it a rewarding way to work. This article was originally published in the Winter 2014 issue of WMB Magazine. Helen is speaking at this year’s WMB Conference & Awards.